I'm adding adverts to my game (...it's the last (it seems loooooooong) step before general release). The apk still exports fine and the game works (so long as I don't actually enable the code that uses adverts), these red lines of text clearly aren't optimal. Any ideas as to what I should do? For clarity, below are the 'Ads' and 'Gaming' plugin selection windows. I've shown where I've made alterations. D = this is my app ID I got from Admob for my game. * Note the tilde separator, not forward slash. * These numbers are not the real numbers used, but they are shown in the same format.
? 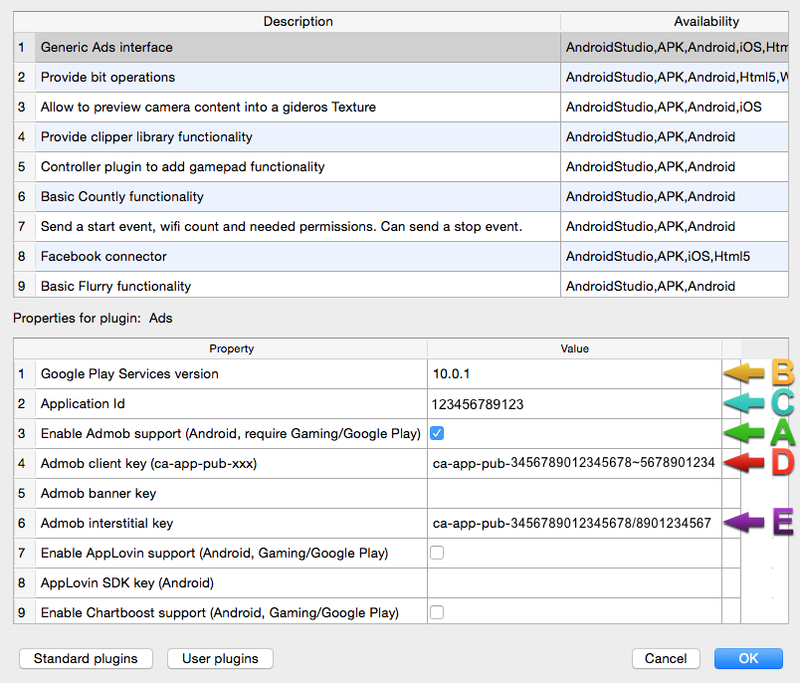 Also, the reason I'm enabling Gaming Service Plugin is because I'm told it's needed when you use Admob. But should I be using Google Play Service Plugin as well or instead? I can't see anything wrong so far, and you can disregard deprecated API as long as it compiles fine. What is the problem actually ? So I can just ignore the red text? Cool. The problem is that, even though I think I've entered the correct information into the plugin boxes, whenever I try to enable ads (using the following code), the exported game crashes immediately after the splash screen. NB: I'm using Gideros 2017.4.1 on an iMac. And the first scene that sceneManager goes to is StartScene (below). NB: If the above code in StartScene is commented out, the game does not crash. Also, I am not an expert about Admob, but shouldn't the key and id be different ? ...near the bottom of that page. Also, I'm not Admob expert. This is the first time I've attempted to use it. you set the key as an integer while gideros expects a string, which is probably the cause of your crash. It's not crashing anymore. And although I don't see any adverts on screen, my 'adtext' variable is telling me I'm receiving them. Is that what to expect when adverts have :enableTesting()? If I'm not wrong you should see admob test banners - which are like placeholder images (unless they changed something, I used it at least a year ago). @pie It took a while, but I can finally see admob test interstitials. Yay! Unfortunately, when I click to dismiss one and go back to my game --almost immediately-- I'm being shown another one ...then another, and another, and another. I have this particular interstitial set at Admob to "show no more than 1 impression per user per 1 minute" (for test purposes). But I get a deluge of them. Yo, glad my topic helps ))). Did you solved a RED TEXT ? Have this too. 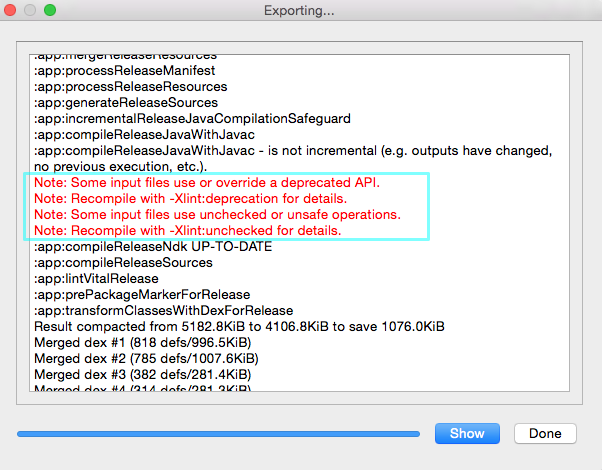 Apparently, red text can be ignored so long as the export builds successfully. NB: I still get red text, but the exported apk works just fine. Same to me. 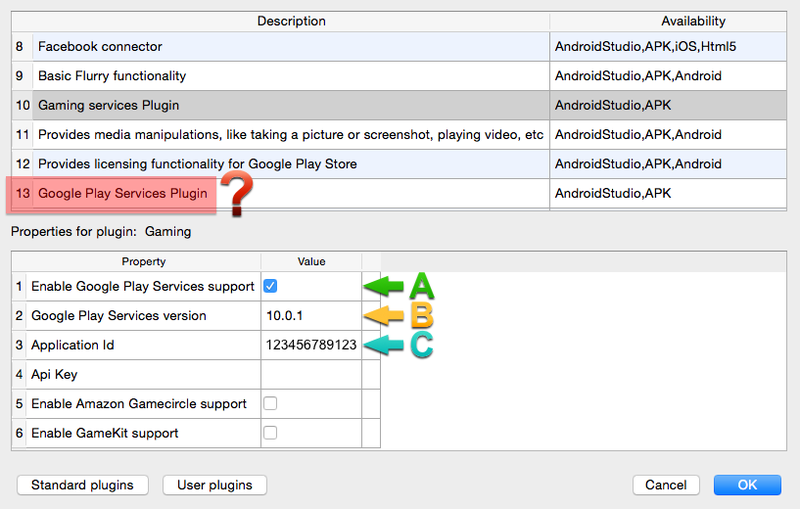 By the way, can you help me with update my Google Play service Plugin in Gideros build, have you kinda manual ? @Yan I don't use the Google Play Service plugin (I use the gaming plugin), so I don't think I can help you. Sorry. Yes, that's right, the google play services plugin is kinda depreciated, use gaming instead (like you did @Favfly ).